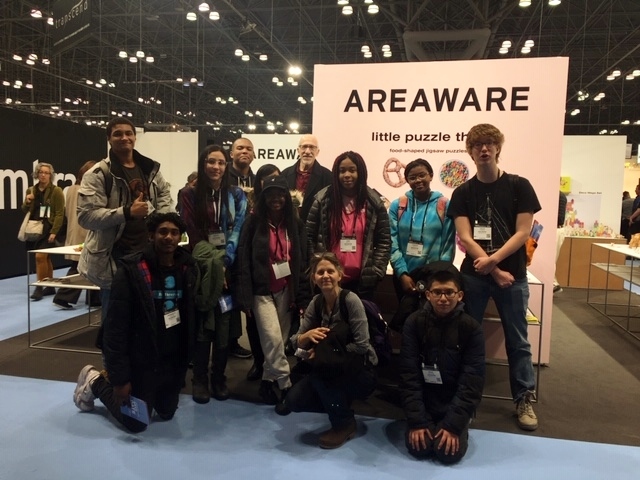 WHSAD’s Incubator club enjoyed taking in the inspirational energy from booths such as Areaware’s at NYNOW. Such trips and experiences are made possible by Incubator’s supporters, Mr. Noel Wiggins, founder of Areaware; Mr. William Harvey, founder of William Harvey studio; and Sinclair Scott Smith, Director of SVA GroundFloor Incubator. The following are narratives from students who attended and explored at the fair. 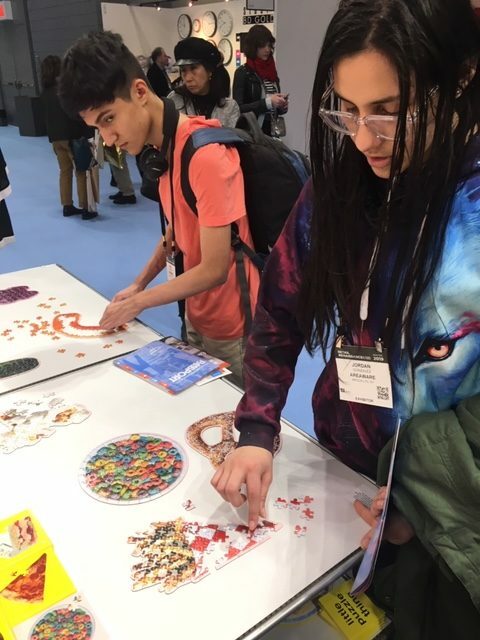 Students, Diego Sernadas and Jonathan Sutchen explore the different puzzles offered at the Areaware booth. 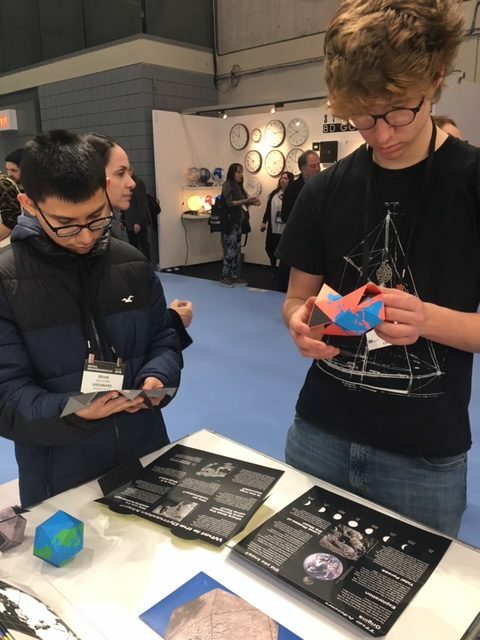 Today February 4th, 2019 I was privileged with the once in a lifetime opportunity as a young designer to attend NYNOW:International Gift Fair, an annual fair of art, designers, and product designers. This year the fair was held at the Javits Center from February 3rd to February 6th. During this event, the Javits center was filled to its literal brim with displays and informative booths all dedicated to the pursuits of design and art. Everywhere you looked there was a wide array of fun fabrics and gizmos, and interesting inventions like clocks that are powered by water, or traditional Japanese pottery and plates that have been made durable and sturdier. But while it was a hazy and often enrapturing event, it was also one of chaos. Every booth was pressed together, and they were all competing for your attention at every moment. I found the concept of getting lost in it all not only plausible but also a pleasant thought in of itself! While there, my group and I visited the Areaware display that featured its many new puzzles for display. I felt a strong and undefinable feeling when I saw those displays. It was bizarre to say the least after months on end of learning the company design and marketing process just to see the finished product. It was inspiring to say the least as I often feel insecure about any of my own designs or choices. Finally, I found myself wandering about the plaza, drinking in the cool hazy scent of each product. I wandered just took it all in, moving from booth to booth and commenting on how the items on display would make perfect gifts for close family and friends. If you every in a stump for a gift, I recommend looking up the next NYNOW. Brian Bacuilima and Aedan Schoen Thomas inspect the designs of some of Areaware’s new products. The visit was very interesting and inspiring. We got to see a bunch of brands, such as the S’well bottles and Areaware displays. In particular, the Areaware booth was interesting because of designs like balance blocks which is designed so that no matter how the blocks are placed, they still balance. Another product, such as the cubebot, is a robot made out of wood joined together with string. It has a bunch of poses like an action and folds into a cube. The booth also interested us because Noel Wiggins, founder of Areaware, has been working with the WHSAD Incubator students. Areaware is good company and deserves to be on display because it makes fascinating products. Through play, Diego Sernadas and Jordan Gonzalez consider the marketability of products Areaware offers. 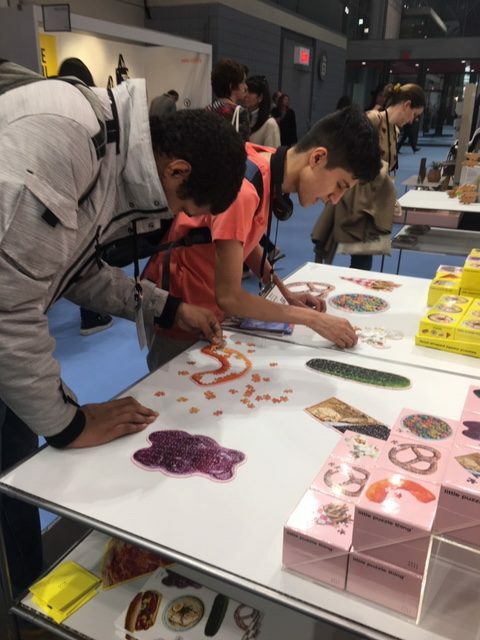 On Monday Incubator had the privilege to attend NYNOW. This is a product and innovative designs trade show at the Javits Center where Areaware had a booth. Areaware is a company that makes many products from puzzles to room decor. Areaware is actually helping us make products of our own from the thought stage to the packaging stage. Going on this trip helped the us understand the different kinds of packaging and get more ideas on how to improve our products. We also got to talk to other booths and learn how to communicate about products and how we can engage others to find out about our products. This helps further enhance our knowledge of making products and how to sell our products.